Ana May Manuel, M.D. always knew she wanted to be help others. With parents who were physicians, Dr. Manuel grew up watching them treat their patients as if they were family and wanted to one day provide that level of care to her own patients. Dr. Manuel is board-certified by the American Board of Family Medicine. She received her medical degree from Far Eastern University in Manila, Philippines and, after graduating, went on to complete an OB/GYN residency and practiced alongside her parents. After relocating to the United States, Dr. Manuel also completed a residency in Family Medicine at United Hospital Center in Bridgeport, WV. Dr. Manuel moved to the Emerald Coast in 2015 and now cares for patients at the White-Wilson Family Medicine Clinic in Fort Walton Beach. She has a special interest in women's and annual wellness exams, preventive care, physicals, and the treatment of blood pressure, cholesterol and chronic illnesses. 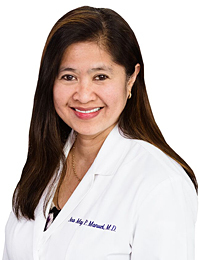 When not practicing medicine, Dr. Manuel enjoys spending time with her husband and sons, traveling, cooking and baking.